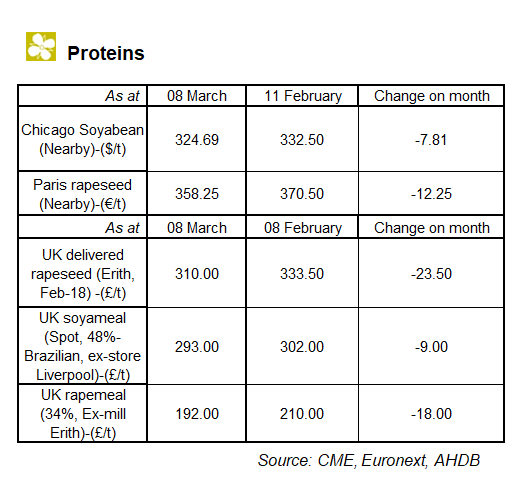 In its latest commentary on the global cereals and oilseeds markets, AHDB has reported that UK feed grain prices fell again over the reference period. Sterling continued to strengthen over the month, with grain prices falling to stay competitive with EU markets. Relatively slow global exports have led to a build-up in grain supplies, acting as a ceiling for prices. UK barley prices continued to fall amidst increased maize usage, up 134% on the year for January. Barley usage in January was at its lowest levels since 2012/13. The feed barley discount continues to grow, now £24.80 compared to feed wheat. AHDB analyst Alex Cook said: “Towards late February, there was news of the Ensus plant restarting its bioethanol production three months early. Despite initial positivity, the plant looks set to focus on maize as its primary feedstock. As such, wheat markets feltlittlepositive impact.